Shabbat items and festive Shabbat Judaica of Kiddush cups, Havdalah sets, Candlesticks and Sabbath Candles, Challah plates, boards and knifes, washing cups, tablecloth are now available in modern and traditional designs. Top quality, sharp prices & secure shipment. 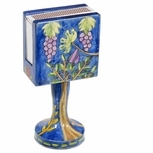 For our extended range of Shabbat Judaica products from Israel please visit our sister store The Jerusalem Gift Shop. A wide collection of Artistic Kiddush Cups for the festive Jewish Sabbath Kiddush. 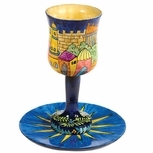 Adorn your family�s Sabbath table with Bible Land Shop�s Kiddush Cup collection. Find here amazing collection of ceramic, glass, silver and nickel Kiddush cups. All our kidush cups are made in Israel. 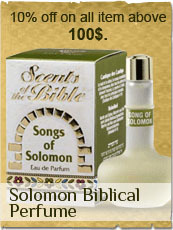 The most beautiful Jewish Sabbath table items at Bible Land Shop. Here you will find Sabbath bread covers, boards, knifes, Sabbath tablecloths, salt & pepper holders and more. 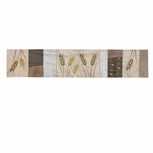 A Sabbath Table Runner can set the mood of the Sabbath dinner and atmosphere by being peaceful, spiritual and cheerful. Sabbath Table Runners for the perfect Sabbath table. The perfect Havdala set for your home, but also great as a gift. 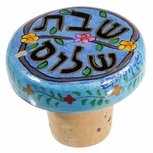 Havdalah sets are used in order to finish the Jewish Sabbath, made of Mahogany, Ceramic, Nickel & Pewter, decorated with festive Jewish designs to fit your family's home. Artistic designed candlesticks will help you add a warm feeling to your home. 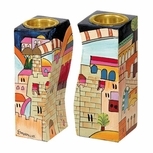 Our candle holders are designed by Israel's most popular artists. Here you will find glass & wood candle holders with a modern design. For your convince we have the most beautiful travel candle holders. Here you will find hand painted travel sticks, silver travel candle holders all designed by Israeli top designers. 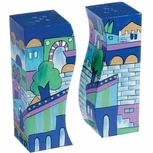 Candle lighting accessories, like match boxes designed by Israeli artists. 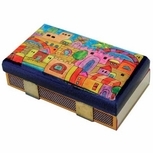 Here you will find a wide range of matchboxes designed by most popular Israeli artists. Whether you choose a sterling silver, or modern designed match box, your gift recipient will be sure to be pleased. A blech (from the German by way of Yiddish word for tin or sheet metal) is a metal sheet used by many observant Jews to cover stovetop burners (and for some, the knobs/dials too) on Shabbat (the Jewish Sabbath), as part of the precautions taken to avoid violating the halachic prohibition against cooking on the Sabbath.